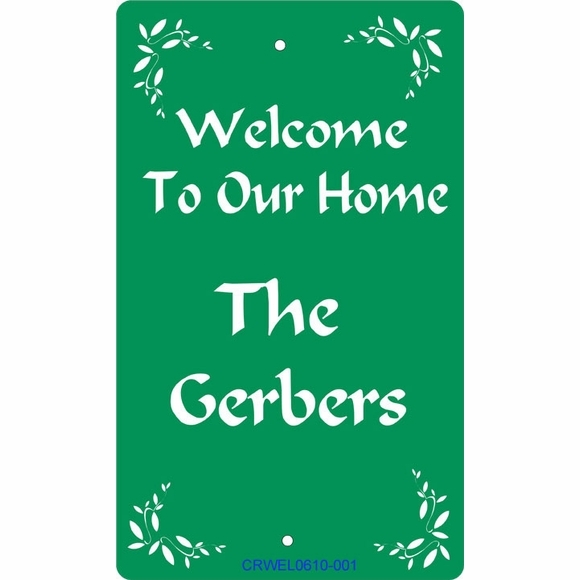 Personalized Welcome To Our Home Sign - - custom made welcome sign for your front porch. Features ivy-leaf corner imprints. Made in USA. 6" x 10" rectangular plaque with radius corners made from sturdy and UV-stabilized laminated acrylic. This wall mount welcome sign holds one line of personalization with up to ten (10) 1" characters, e.g. Gerber's. "Welcome To Our Home" and the word "The" are standard on this sign. Note: the style number in the lower center on the sample sign is for internal use only and is not engraved into your custom sign. Customized with your choice of color and name you specify. Characters and corner imprints are permanently engraved into the sign during the production process. Personalized Welcome To Our Home sign. Made in USA.